The Neymar Jr. 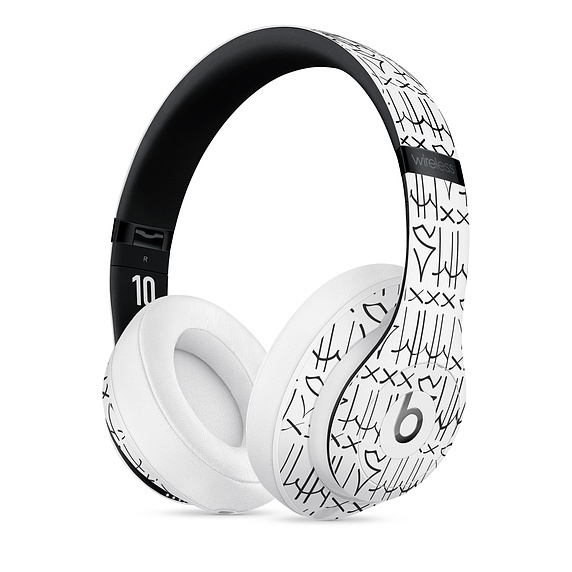 Custom Edition headphones feature graffiti-style decals over the outside of the ear cups and headband that hark back to the soccer player's childhood roots in the streets of São Paulo and pay homage to his famous "Shhh..." tattoo. The headphones also feature a number 10 inside the headband, representing the Paris Saint-Germain player's shirt number and 10-year professional soccer career. Inspired by the graffiti-writing style from the São Paulo streets where it all began, the Beats Studio3 Wireless – Neymar Jr. Custom Edition honors Neymar’s strength of character. The design is a tribute to his famous "Shhh…" tattoo, representing his ability to adapt to anything, on and off the field, staying true to himself. Priced at $349.95, the new Beats Studio3 custom-designed headphones are listed by Apple as "coming soon," but anyone interested in picking up a pair shouldn't have to wait too long, as Neymar Jr's birthday was just yesterday. Does it roll on the floor in agony if you hardly touch it? All beats headphones are tacky as hell. I wouldn't be caught dead wearing any sort of Beats over-ear headphones. Much less pay $350 for a piece of plastic paying homage to some dude who's covered in tattoos and has an incredible aversion to admitting fault. This is better. Internet is awesome! Nobody’s said it yet. Can’t believe it. Assuming that’s an NFL player (helping prove my point), 99.9% of the world has no idea who that is (including me). This seems hardly front page worthy.